The Landrush Phase of the .PW TLD launch started Tuesday 19th of February 2013, and will end Friday the 15th of March 2013. Anyone may apply without any restrictions, and generic domains are allowed. In the event that two applicants apply for identical domains, an auction process will be introduced. The Registry has reserved select Premium Domains to be allocated at a future auction process. 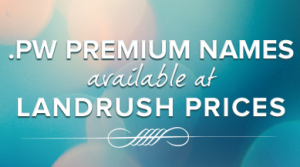 However, in a surprise move, the registry recently allocated a select list of premium domains to Landrush. 2 character ASCII names, as well as 1 character Chinese, Japanese and Korean IDNS are available during Landrush. In general, IDNS in multiple languages and scripts are supported. No restrictions. Anyone may register any amount of .PW domain names.